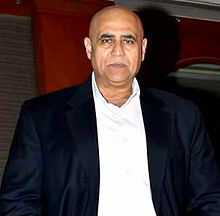 Puneet Issar is an Indian actor and director. He is most famous for his role as Duryodhana in the Mahabharat TV show (1988–1990), and directing Garv: Pride and Honour (2004) starring Salman Khan. His other notable roles are in Border, (a 1997 war film), directed by J. P. Dutta, and second lead in the cult Indian horror film Purana Mandir in 1983. He started his career with the movie Coolie in 1983. During the filming of an action sequence of this movie, he accidentally injured Amitabh Bachchan nearly fatally and suffered the industry's backlash due to it. Issar participated in the Indian TV reality show Bigg Boss season 8 in 2014-2015. Issar starred as a villain in several movies (over 150 Hindi films and 100 non-Hindi) during the 1980s and 1990s, such as Zakhmi Aurat, Jagruti, Kal Ki Aawaz, Palay Khan, Teja, Prem Shakti and many more, which include the Mohanlal starrers Yodha and Pingami; Salman Khan starrers Sanam Bewafa, Chandramukhi and Suryavanshi; Akshay Kumar starrer Aashant and multi-starrers such as Kshatriya. He also played a villain in the Shahrukh Khan starrer Ram Jaane. He appeared in the hit war film Border. In 1982 he was involved in an on-shoot incident with Amitabh Bachchan. Amitabh got seriously hurt and many blamed Puneet for the accident. He later admitted that he had to face a lot of problems in getting roles in movies due to the notoriety of the incident. Some people even misunderstood that Amitabh's clout might have had affected his career very much, but he clearly stated that this was untrue. He played the role of Duryodhana in the epic TV series Mahabharat (1988–1990), directed by Ravi Chopra. It was this role that gained him mainstream popularity. He along with other actors of the epic TV show often toured the whole of India and even abroad to perform live shows based on the epic throughout the 90's. He played the Indian Superman (1987 film), a Bollywood version of the Hollywood movies. He played the second lead in the cult Indian horror film Purana Mandir in 1983. Later he did many other horror movies such as Tehkhana in the 1980s. He also starred in movies such as Krrish, Partner, Aryan, Bachna Ae Haseeno and many more in the 2000s. He has also directed TV serials such as Hindustani and Jai Mata Ki starring Hema Malini. He has starred in over 12 TV serials such as Junoon, Sahil, Noor Jahan, Vikram Aur Betaal and many more. He has appeared in over 1800 episodes on Indian television. He played the role of King Bimbisara in the feature film Gautama Buddha – The Life and Times of Gautama Buddha. He also starred in Left Right Left of the Indian Channel Sab TV. He has also worked in a number of Punjabi films such as Rab Ne Banayian Jodiyan and in a few Telugu films. He has also given a brilliant display of his acting skills in the mythological film Suryaputra Shanidev, which released in 1997. In 2004, Issar directed the film Garv: Pride and Honour starring Salman Khan and Shilpa Shetty in lead roles. The opening collections of the film were good, and overall it was declared "Above Average" at the box office. His latest directorial venture I Am Singh, the story of which is also written by him, released in December 2011. The film did average critically and commercially. In 2013, Paras Lubricants Ltd signed Mr Puneet Issar as their Brand Ambassador for their range of Automotive Oils and Lubricants. He also played the role of Parashurama in the recent TV series Mahabharat. He then went on to playing the role of "Daar Ji" in Bani Ishq Da Kalma. Puneet participated in the Indian TV reality show BIGG BOSS season 8, in 2014/2015. He made it to the grand finale and was one of the 7 finalists. He was evicted from the TV show Bigg Boss season 8 on 3 January 2015. His was the last and final eviction before the season 8 of BIGG BOSS ended and a spin-off series titled Halla-Bol started. Puneet lasted in the house for 105 days. At 56, he was the oldest contestant to do so and last the entire season in the house. Puneet Issar is the son of film director Sudesh Issar. He is married to Deepali, daughter of Punjabi actor Diljit Puri and Bengali singer Ashita Puri, and sister of Satyajeet Puri (famous child star of the 60's, 70's and 80's ). Puneet has two children, a daughter and a son, Nivriti and Siddhant. Other than being a trained actor himself, Puneet has worked as a speech, diction and method acting professor. He also is a trained mixed-martial-artist and is skilled in kung-fu, karate, boxing and wrestling. Wikimedia Commons has media related to Puneet Issar. ^ "Super cop". The Hindu. 8 July 2004. Retrieved 10 January 2012. ^ "Cirrhosis of liver struck teetotaller Big B after Coolie". The Times of India. 25 April 2010. Retrieved 10 January 2012. ^ "Contracted liver cirrhosis from donor, Big B writes in blog". Indian Express. 25 April 2010. Retrieved 10 January 2012. ^ "'I am praying for him again'". The Times of India. 2 December 2005. Retrieved 10 January 2012. ^ a b "The producers thought Garv would never release". Rediff.com. 1 July 2004. Retrieved 10 January 2012. ^ "Box Office 2004". Boxofficeindia.com. Archived from the original on 14 October 2013. Retrieved 10 January 2012. ^ a b "Puneet Issar – Brand Ambassador for Paras Lubricants". Palco.co.in. Retrieved 1 February 2013. ^ a b "Paras Lubricants signs Mr Puneet Issar as Brand Ambassador". onlineprnews.com. Retrieved 3 February 2013. ^ a b "Paras Lubricants Ltd". facebook.com. Retrieved 1 February 2013. This page was last edited on 24 April 2019, at 17:02 (UTC).